A stubbly, worm-like creature featuring as many as 30 limbs combed the seafloor during the early Cambrian period, according to new research. Its bizarre appearance and feeding behavior are unlike anything ever seen before. Researchers digging in British Columbia’s Burgess Shale have uncovered the fossilized remains of a 500 million-year-old lobopodian. Named Ovatiovermis cribratus, the newly described animal was only a few inches tall, and filter-fed by waving its body back and forth to scoop up tiny prey. Given its extreme age and unique physical characteristics, scientists say it’s one of the earliest examples of arthropods in the fossil record—a group of animals that includes insects, spiders, scorpions, and crustaceans. Lobopodians (from the Greek meaning “blunt feet”) lived during the early Cambrian period and are known for their worm-like bodies and stubby legs. Like other lobopodians, Ovatiovermis cribratus featured somewhere between 20 and 30 limbs, but it was unique in that it lacked the defensive spikes typical of these creatures. 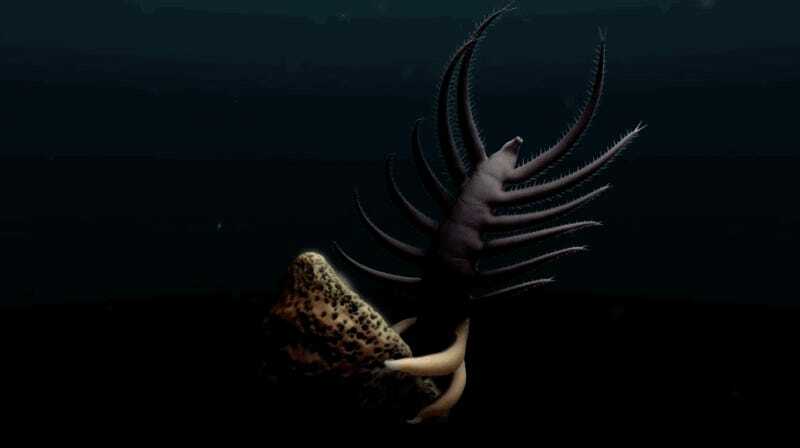 Royal Ontario Museum researchers Jean-Bernard Caron and Cédric Aria analyzed a pair of fossil specimens found at the Burgess Shale, allowing them to document this animal’s distinctive body plan. The top half of O. cribratus features long and slender legs equipped with a double-row of bristles. Its bottom half is thicker and more robust, making it look like a ginger root. This animal was a filter-feeder, anchoring itself to the seafloor with hooks while it combed the water for food using its toothed front limbs. Arthropods, of which lobopodians are an extremely early example, have gone on to become one of the most successful groups of animals on the planet, encompassing nearly 80 percent of all known species. Today, arthropods are divided into several subgroups, including chelicerates (a group that includes scorpions and spiders), crustaceans, insects, and myriapods (e.g. millipedes and centipedes). Prior to the emergence of these groups, early arthropods included tardigrades, onychophorans (velvet worms), and the extinct lobopodians. Together, these animals comprise a catch-all group known as the “panarthropods.” The discovery of Ovatiovermis cribratus—with its smooth legs and filter-feeding behavior—is now considered the most primitive known member of the panarthropods. You might want to remember that the next time you see a spider crawling around your bathtub. 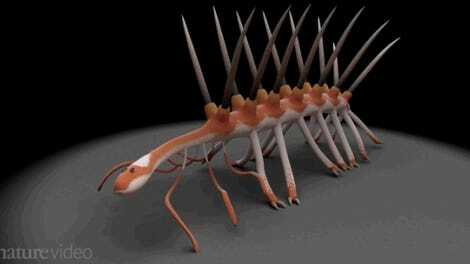 As scary as modern arachnids appear, their Cambrian-era grand-daddies were truly an unsettling sight to behold.